A new explanation for these findings has been discovered by researchers at the University of California, San Diego School of Medicine and Skaggs School of Pharmacy & Pharmaceutical Sciences, who describe for the first time how statins activate the bacterial killing properties of white blood cells. Surprisingly, the statin-induced improvement in bacterial killing did not correspond to increased uptake of bacteria by these specialized white blood cells. Rather, the researchers found that statins stimulated the phagocytes to release "extracellular traps" – specialized webs of DNA-based filaments embedded with anti-microbial peptides and enzymes capable of ensnaring and killing bacteria before they spread in the body. 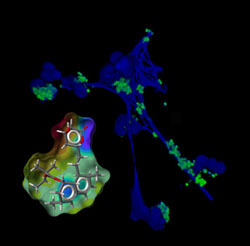 A human neutrophil producing DNA-based extracellular traps (stained blue), entrapping the human pathogen bacterium Staphylococcus aureus (green). Three-dimensional structural rendering of Simvastin, a statin. Prior research had described various anti-inflammatory properties of statins, suggesting that these effects could contribute to a reduction in disease severity during severe infections. Nizet and Glass explored a different hypothesis: That statins might actually aid the body in clearing itself of infectious microbes. The researchers focused on Staphyloccocus aureus, more commonly called “staph,” a frequently antibiotic-resistant human pathogen responsible for everything from minor skin infections to life-threatening meningitis and sepsis. Mice treated with statins were more resistant to staph infections, and phagocytes isolated from these mice were more effective at killing staph bacteria. Simple exposure of freshly isolated human white blood cells to statins in a test tube markedly increased their ability to kill staph and other important disease causing bacteria. In each case, the increased killing correlated with greater release of the DNA-based extracellular traps by the phagocytes. 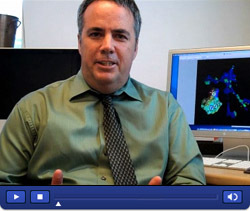 The UCSD findings demonstrate that statins have important pharmacological effects beyond inhibiting cholesterol production. “We found these drugs fundamentally alter how white blood cells behave upon encountering bacteria,” Nizet said. “In our studies with staph bacteria, the net effect of statin treatment was to improve bacterial killing and extracellular trap formation. Lead authors of the study were Ohn A. Chow of the Departments of Pediatrics, Cellular and Molecular Medicine and the Biomedical Sciences Graduate Program at UCSD and Maren von Köckritz-Blickwede of the UCSD Department of Pediatrics, now at the University of Hannover. Additional contributors include A.
Taylor Bright of the UCSD Biomedical Sciences Graduate Program; Mary E. Hensler and Annelies S. Zinkernagel of the Department of Pediatrics at UCSD; Anna L. Cogen of the UCSD Department of Medicine; Richard L. Gallo of the UCSD Departments of Pediatrics and Medicine and the Veterans Administration San Diego Health Care System; Marc Monestier of the Department of Microbiology and Immunology and Temple Autoimmunity Center at the Temple University School of Medicine; and Yanming Wang at the Department of Biochemistry and Molecular Biology at Pennsylvania State University.